The app is very similar to the Argos app; items cannot be purchased directly through the app, but items can be reserved for in store collection. Unlike on the Argos app, users need to wait three hours before items are ready for pick up, which is OK if you are ordering from home and don’t intend to head straight for the store, but it does make it harder to attract sales from people when out shopping. There are 30,000 products featured on the app, and 20,000 of these can be reserved for in-store collection. If you have pre-selected your local store, the app will tell you if stock is available when you visit the product page. The link takes you to the main site, which is harder to use on a mobile. The option to buy items through the app would be a better alternative for future updates. With 30,000 products to search or browse through, users need decent filtering and sorting options to make product selection easier, and the app does this well. This is a well designed and usable app, which is not surprising since it was developed by the same in house team that launched the excellent Argos app. 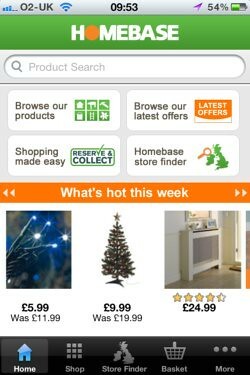 Like Argos, Homebase has been focusing on driving multichannel sales. 40% of its customers research products on the main website before heading in-store, so this reserve and collect app is a logical extension of this strategy. Many of the 100+ interviews we have done this year were on the subject of e-commerce, and we have spoken to e-commerce managers from many well known retailers such as Zappos, John Lewis and M&S, as well as industry experts like Dr Mike Baxter. It’s that time of year when various analysts and research groups announce their predictions on how much online retail will be worth this Christmas.